Google Pixel 2 and Pixel 2 XL, the company's anticipated next-generation Pixel devices, have been leaked in full merely a day ahead of the official launch. Prolific tipster Evan Blass aka @evleaks shared images of the Pixel 2 and Pixel 2 XL which show the handsets in their full glory. Based on preliminary leaks, the Google Pixel 2 and Pixel 2 XL are said to be manufactured by HTC and LG respectively. The leaked images confirm that the new Pixel 2 XL will follow the lead of 18:9 aspect ratio displays, and it will be the biggest highlight of the handset. The Pixel 2, on the other hand, will come with a 5-inch full-HD display with an aspect ratio of 16:9. The leaked images suggest that both the handsets will sport dual speakers at the front - one above and another below the display. The home screen seems to have also received a slight revamp, and includes calendar details such as a scheduled meeting alongside weather, and time information. Unlike the original Pixel and Pixel XL, the new Pixel hardware seems to have received a complete overhaul when it comes to the rear panel, as per a report by VentureBeat. The back panel will sport a glass at the top part though this year it has been painted in solid colours. The leaked images tip that the Pixel 2 and Pixel 2 XL will come in two colour combinations Black for the top part, and White for the bottom part at the back of the handset. A separate report claims pricing for the new Pixel hardware. According to Droid Life, the Pixel will be priced at $649 (roughly Rs. 42,000) for the 64GB and $749 (roughly Rs. 49,000) for the 128GB version. The Pixel 2 XL, on the other hand, will be priced at $849 (roughly Rs. 55,750) and $949 (roughly Rs. 62,250) for the 64GB and 128GB versions respectively. The Google Search bar has also been relocated to the bottom of the screen which seems weird to start off but is a better placement considering the fingers easily reach the lower part of the screen. The app icons are rounded, similar to Android Nougat version. Both the handsets are expected to run Android 8.0 Oreo out-of-the-box. Moreover, the right panel can be seen housing the volume and power buttons while the left panel include the SIM card slot. 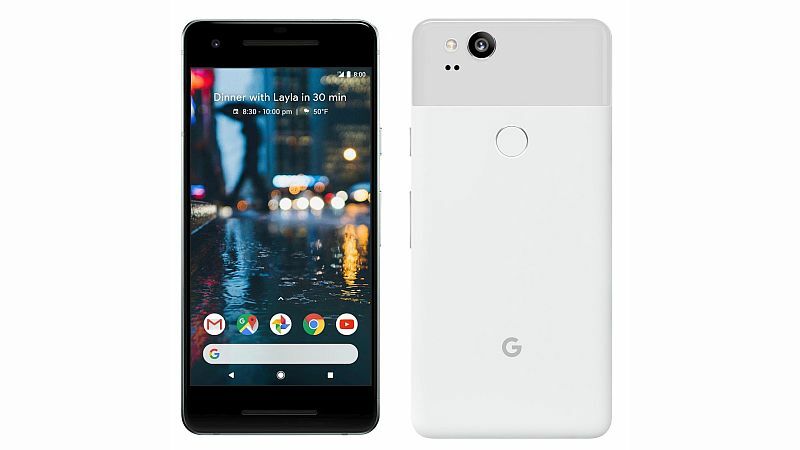 For specifications, both the Pixel 2 (pictured above) and Pixel 2 XL smartphones are expected to be powered by Snapdragon 835, similar to other Android flagships launched this year. In terms of display, the Pixel 2 XL is said to sport a 6-inch QHD+ display with an 18:9 aspect ratio. Other rumoured specifications include 4GB of RAM; 64 or 128 GB storage options, and 12-megapixel rear camera. Stay tuned to Gadgets 360 for live updates on the new Google Pixel 2 and Google Pixel 2 XL. The launch event will kick off on Wednesday at 9am PT (9:30pm IST).